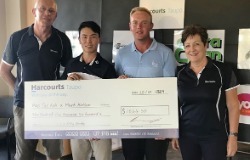 Tae Koh, the defending champion and rookie Professional Mark Hutson tied for first place in the Harcourts Taupo Pro-am. Mark Hutson had his debut as a golf professional last weekend and today he managed a win in only his fourth event. Both golfers scored six birdies and one bogey for five under par 67's and won by a single stroke from Te Puke professional Jared Pender, Grant Moorhead from Westown in Taranaki and Oscar Cadenhead from Christchurch.The Taupo Centennial Course was in excellent condition and the weather was warm with a strong breeze.